There is nothing like a sausage in a bun to tickle the taste buds and fill that hunger spot. It can be a snack or it can be a meal. It looks delicious, tastes delicious, and gives plenty of room for you to be both versatile and individualistic about the enterprise you develop around the sausage. Sausages are a "10" and both Makkas and the Colonel don't have them the way you will, nor do those burger 'boys' down the road. The streets of Malaysia are ready for the sausage and who dares wins here. Sausages are actually incredibly easy to make. You can base them on meat, fish, or vegetables. You can make them fresh or smoked. What's important is to blend the salt, spice, herbs, and savories together so you get a uniform taste. There are so many recipes available on the net, your problem is going to be where you start. Really what you put into a sausage is only limited by your imagination. 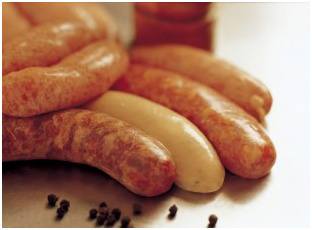 But this is a good problem as you can introduce new types of sausages to keep interest with your customers. Try a basic rendang beef, Middle-Eastern lamb, and BBQ chicken sausage for example. These can all be ground and mixed together using a kitchen or meat grinder grinder. Then soak the Halal sausage casing in water before you stuff them up. You can use either natural of collagen casings which you can search for on the internet. 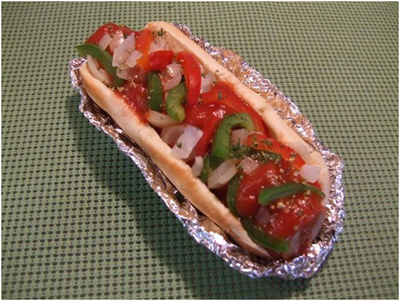 An alternative vegetarian sausage recipe without casings can be seen in the YouTube video, HERE! Now to the business side. Sausages are best made fresh for each day's business. That means a few hours preparation before going out to a gerai, or you could be continually making fresh sausages in a little stall or cafe. The sausages can be served up in a bun with toppings such as mustard and herbal mayonnaises, horseradish and wasabi so those who like it hot, or even an Asian or Mexican chili attack. The sausage, sauces, bun and vegetable accompaniments maketh the sausage and this again is up to you imagination. Have a few choices for customers to drool over. The selections you make will definitely be a major contributor to the success or failure of your project. As a stand-alone independent stall, you in the right area will be able to do a brisk business. 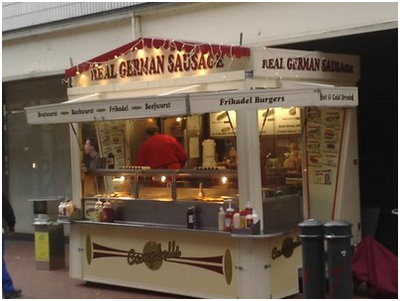 For those more entrepreneurial at heart you may consider franchising the concept and supplying the sausages and other ingredients to the franchisees. Make the franchises cheap and affordable for people to get into, as the long term supply of the sausages will be very profitable. Of course in a shop or cafe you have the extra option of selling the fresh sausages and sauces for people to cook and serve at home. In the major cities like KL, Johor, and Penang, this could be a very lucrative business in its own right, and you may even find other stores who can act as stockists for you. So here is another fast food you can get into and introduce to your area before anybody else. You can keep the business small as a gerai or cafe, or grow it into a supply based business. That depends on whether you prefer to serve people or concentrate on production. Sausages are a big food all around the world and haven't caught up with all the parts of Asia yet. Sausages are going to be another delicious choice for consumers in the not far distant future. Here is your chance to get in on the ground level.